We recognize that there are quilters out there who want to complete their own quilting using a long arm quilting machine but don't have their own machine. After completing a class to learn all the basics of how to operate the machine and load your quilt, you are then certified to rent the Long Arm and start quilting your own quilts. We use “Red Snappers” to load and unload the quilt on our machine frame. This is a fast and easy way to load your quilt. No pins or zipper leaders are needed to load a quilt on the quilt frame. 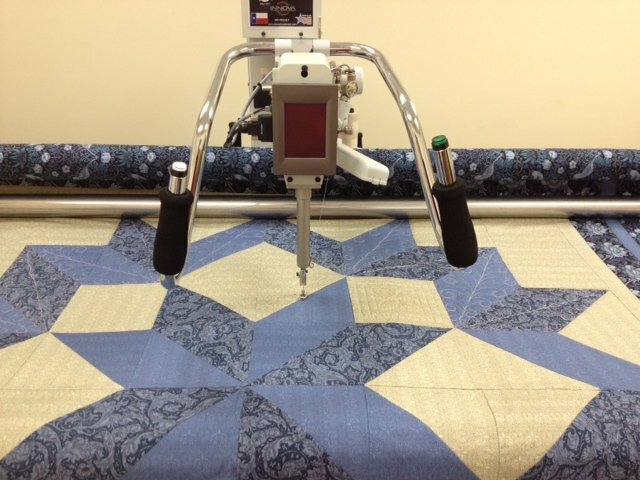 Using Red Snappers allows you to easily reload a quilt that has been partially quilted. Needles - You will need to purchase a long arm needle from Woodside Quilting with each rental. Thread- To insure proper operation of our machine, we require the use of Superior brand cone thread. We carry cones of Omni Thread, by Superior thread in a variety of colors and can order any color not on hand. We also offer the use of our cones of thread for $7.50. Please get thread pre-approved before your rental. Bobbins - Only Innova bobbins can be used on the Innova machines. You may use our bobbin winder to wind bobbins for your rental time. You may also purchase bobbins from us if you plan on renting the machine multiple times for your use. Batting – You may purchase batting from us or bring own batting. We carry Hobbs 80/20, 96” and 120” wide, Hobbs 100% cotton, bleached and un-bleached, 96” wide, Hobbs 80/20 – 60” wide.. Rental fees – The minimum rental session time is 3 hours at $35.00 per session. If you need additional hours after your rental session, the hourly rental fee is $15.00 per hour. You can also schedule two rental sessions together if you feel you need the whole day. You can pre-schedule your rental time to be sure you get the rental time that you need in order to finish your quilt. (Be sure to estimate extra rental time for your self for incidentals that may occur during your quilting time) If another quilter has not already scheduled time on the machine and you need more time to finish your quilt, you can add additional hours to your rental time in order to complete your quilting. If another quilter has already pre- scheduled their rental time and you are not complete. You will need to unload your quilt and schedule additional rental time in order to complete your project. Estimating your rental time – This solely depends on the size of your quilt, how densely you quilt and how comfortable you are with the machine and quilting experience. As an example you should be able to complete a queen size quilt in 4-6 hours depending on our densely you quilt. The class fee is $30.00 and runs 2 – 2.5 hours. Limit 4 students per class. Call the store to signup for a session. Rental Session, Class and Retreat Fees are due at the time you signup and are not refundable unless you provide notice 7 days before the session or event begins.